Yes, there is help and healing for you as well. Depression and a sense of hopelessness are just two of many emotions that people feel when they have a spouse, significant other or family member who continues to drink or use drugs with no end in sight. Sometimes we become so wrapped up in everything our addicted loved one is doing that we lose all sense of ourselves and damage our relationships with other family members and friends. Having an addicted or alcoholic loved one can be such an isolating experience that it’s easy for us to feel utterly alone. The good news is that there are almost as many forms of help for us as there are for the addict or alcoholic. Please do not be ashamed to admit you need some help and to ask for it. We can lead happy and peaceful lives regardless of what the addict/alcoholic is doing. 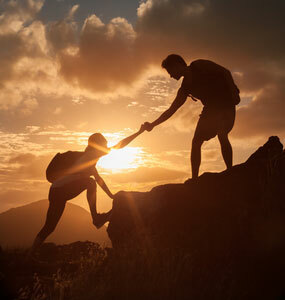 CRAFT (Community Reinforcement and Family Training) is offered as support for friends and family members of an addicted person and is associated with SMART recovery. This is a secular program. Al-Anon meetings are offered as support for family members and is an offshoot of the AA program (Alcoholics Anonymous). This is a spiritual program that is not specifically Christian. Celebrate Recovery is a Christian-based program for friends and family members as well as for addicted persons wanting to be sober. Sometimes, individual therapy with a counselor is needed and can provide enormous benefit when the depression you are feeling has lasted for several weeks. Finally, simply knowing that we are not alone can provide such a sense of relief. The online community at SoberRecovery is filled with people just like you. We know exactly what you are feeling and have been going through. In sharing our experiences and supporting one another, we find strength and hope for our futures together! Often times, it is easy to lose sight of the importance of caring for ourselves when we are struggling to help our loved ones trapped in the ravages of addiction. However, caring for yourself is key in order to be of any help to others, especially if your aim is to help a family member struggling with addiction. It is important to know that there are resources available to assist you in dealing with the depression you are feeling. You may want to consider seeking out the support of a therapist in your area who is well-versed in addiction and how it affects the family. A therapist can help you learn how to care for yourself while your loved one is thinking about beginning their journey to recovery. The last, and often best resource, is to keep regular contact with others who care about you and can provide you with support on a regular basis. These people (friends, family, pastor, etc.) can help keep you accountable to the commitment in caring for yourself. Depression in families is often part of the wreckage of addiction and assessment by a mental health professional can be beneficial. There is the hope of relief for those family members who are suffering alongside their loved one. The first thing that you need to know about this situation is that you are not alone. Many loved ones of alcoholics are exhausted and depressed from trying to control their loved ones’ drinking. Many think that if he or she just loved me more, he or she would stop. Unfortunately, alcoholism is not a matter that can be controlled by just trying harder or just loving someone enough. Educating yourself on alcoholism often helps to raise awareness and ultimately accept that we really can’t control when or if our loved one drinks. Many times, dealing with the constant stress and emotional roller coaster of living with an active alcoholic can result in depression. If your symptoms have lasted for more than a few days or if you feel you may hurt yourself or others, it is very important to seek medical help right away. It is not uncommon to feel this way and there is nothing to feel embarrassed about, but prompt medical attention is an important first step. Often people dealing with active alcoholics feel isolated and helpless. Reaching out through counseling, support groups and/or online forums is an excellent step towards becoming healthier and finding ways to handle the many challenges of living with someone with a drinking problem.